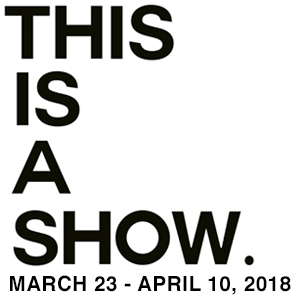 This Is a Show, is an art exhibition created by the Third Year BFA studio seminar students. The art work exhibited is a showcasing of their ambitious final projects for the end of the school year. The show will include a diverse range of mediums and approaches See them all at the opening reception, Friday the 23rd in the Visual Arts Centre at the Cohen Commons. Held in conjunction with the opening receptions for @Senders in the Artlab Gallery.